Our Apex arcade machine is the best regarded classic stand-up arcade cabinet available giving you superb quality gaming in the finest of style. With its sleek, cool looks and elegant slim-line design, the Apex looks perfect in any surroundings – whether at your home, in your office or as a great addition to your games room. The Apex boasts a large 20” square HD screen and a full 2-player control panel which has been specially designed at a position and angle to ensure maximum comfort and top playability. It is unobtrusive and fits elegantly into any desired space; measuring a mere 65cm in depth and 56cm in width. With one of these terrific Apex arcade machines, you can look forward to enjoying a whole host of arcade and retro console classics in the luxury of your own location. Packed with access to over 10,000 of the best classic games, the Apex now also comes with game loading functionality so once home it can be made to run 1000’s of your favourite classics from the arcade and older console era. Our Apex arcade machines come in 3 different formats to choose from depending on your needs and wants: Apex Play, Apex Media and Apex Elite. The Apex is a wonderfully designed cabinet that is fully customisable, highly playable and extremely user-friendly. 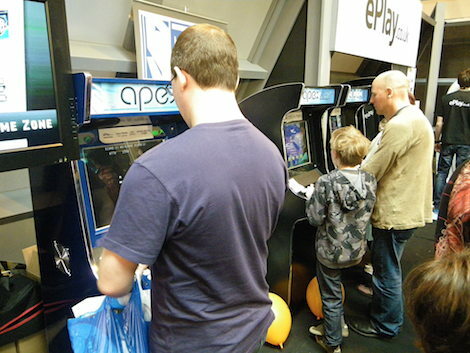 The Apex stand-up arcade machine plays like a dream and guarantees many years of enjoyment. Now, it’s simply up to you to choose between going it alone, joining forces to defeat the eternal foe and taking each other on in combat to the death! Recognised by retro arcade machine enthusiasts as being by far the best compact stand-up arcade machine ever made, the Apex has received many major accolades including being voted No1 in a Gadget Show group test and the T3 Best Buy Arcade Machine. The Apex also benefits from a great speaker system delivering crisp sound along with great bass and the volume adjustable via the wired remote on the cabinet. All of our games machines come with a full 12 month warranty. For all the answers, check out our FAQs section. All Apex arcade machines are custom made to order by hand in the UK and are fully customisable so you can go all out to design the cabinet of your dreams. Whilst the Apex really looks the part, it’s also very easy to use – plug and play, loading directly into the game selection menu with a one pushbutton on/off switch. All of you who have the privilege of owning the Apex can just enjoy the pleasure of reliving your favourite arcade games in the way that you remember, all on one of the finest arcade cabinets in the world.